Q. Which ADSL speed should I choose to get the best speed without wasting money? A. There are several factors. Use the following charts to help you decide which speed is best. Note: If you are looking for advice on which type service (ADSL vs. Hikari, etc.) to order then you should see the Service Advice page instead. With all DSL services, the speed declines over distance from the server located in the telephone exchange office. The faster the speed at the start, the faster the decline so, as you get further from the exchange building, the speeds tend to converge. 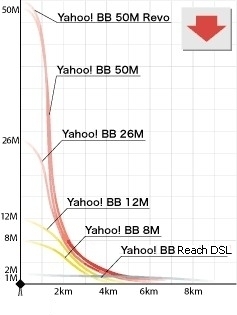 Here is a chart that show the estimated approximate speeds that you can expect to get with Yahoo! BB ADSL service. Note that in the download chart (left) each horizontal line represents a difference of 4M. In the upload chart, 3 lines represents a difference of 1M. Note that these charts do not show the exact speed you'll get. In fact, due to the nature of DSL technology, your actual speed may vary from the chart by significant amounts due to the conditions at your location. First of all, for most people, the download speed is more important than the upload speed because the download speed will affect how fast pages load and files are transferred. Most people only upload small amounts of text (URLs and email, for example). The primary exception is in peer-to-peer sharing where files are loaded both up and down. At the most basic level, there are two factors that drive the decision for most people. Generally speaking, most users either want to have the fastest possible connection or they want to have the most economical service. At face value, the choice seems straightforward; you choose the fastest service or you choose the cheapest service. However, there's more to it than just speed and price. As you can see by looking at the above chart, the speeds for the various services start out very different but converge at about two kilometers. The faster services are faster beyond that point, but not much. The 50M and 26M in particular almost seem to merge. The above charts display the speed differences. In order to judge the best service, you also need to consider price differences. Here are the prices for various speeds. Shown are the prices for Yahoo! BB both with and without NTT phone service. If you order YBB with NTT, then you must pay both the Yahoo! BB cost shown here plus the cost of NTT tolephone service (generally around ¥1,500 to ¥2,000/month). So, as you can see, the cost is about the same either way. Note: prices shown here include 5% sales tax as well as all miscellaneous charges (modem, ISP, etc.). Please keep that fact in mind whenever comparing prices of other companies. There isn't much difference in price between different companies so, if another service seems to be much cheaper, then they're probably leaving something out of the price. For details on prices, see the Price Chart page. Following are general recommendations at various distances. For more detailed explanations of the recommendations see the "Speed Difference vs. Cost Difference" section below. There are three recommendations for most of the distance ranges: Speed, Medium and Economy. The "Medium" choice is the medium speed at the medium cost. The 26M service is only ¥105/month less than 50M so 26M is not usually recommended unless the 50M service is unavailable. 50M Revo offers the same download speed as 50M but has faster upload speeds and so is attractive to users who are interested in gaming and sharing. The faster upload speed is only effective, however, for users who are within about 800 meters of the exchange building. Reach DSL is a special DSL that is much slower than the other but has the advantage of "reaching" much more distant users. And, slow as it is (about 800 kbps), it's still 15 times faster than dial-up. Note: above 5000 meters, the stability of 50M service becomes an issue. The only way to find out if it will work is to have it connected. Likewise for Reach DSL above 7000 meters. In either case, there is no charge for trying as long as you cancel during the first month of connection. The 50M service is only 100 yen/month more than the 26M service. If your distance is less than 2,000 meters, then the 100 yen extra for 50M is a good bargain. On the other hand, beyond 2,000 meters, you have to ask yourself if the 100 yen difference is a big enough savings to justify getting 26M when, even with convergence, 50M is still faster. Bottom line: for most people, 50M will be a better choice than 26M regardless of distance. The 50M service is 840 yen/month more expensive than the 8M service. Comparing 50M speed with 8M, you can see that below 2,000 meters, the extra charge for 50M makes sense if speed is your goal, but between 2 and 3,000 meters, you need to consider whether the small difference is speed is worth the extra charge. Above 3,000 meters, however, Reach DSL should be considered rather than 8M. Bottom line: Above 2,000 meters, 50M will still be faster, but the extra charge may not be worth it (unless you are getting BBTV, in which case you will want as much speed as possible). The 12M service is 420 yen/month more expensive than the 8M service. Comparing 12M speed with 8M, you can see that below 2,000 meters, the extra ¥420 for 12M gets you faster speed, but above about 2,500 meters, small difference is speed is probably not worth the extra cost. Again, above 3,000 meters, Reach DSL should be considered. Bottom line: 12M is probably not worth the extra cost over 2,000 meters or so. 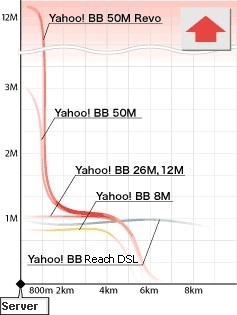 If you are above 3,000 meters, you should consider whether Reach DSL is the best choice. Reach DSL– which is the same price as 8M–is a special type DSL, available in some areas, that is designed to 'reach' greater distances than other DSL types. It is much slower than the other services when it leaves the exchange building at about 0.9 M. However, its speed doesn't have the sharp decline others have and at long distances it's generally faster and more stable than the other services. It is shown as a nearly horizonal gray line in the charts above. Reach DSL is stable up to about 7 to 8 thousand meters. While it is much slower than the other services (near the exchange), it is important to realize that it is still about 15 times faster than dial-up service. Looking at the download chart, you can see that above 3,000 meters, Reach DSL is a safer choice than 8 or 12 M. Likewise, above about 4,000 meters, Reach is a safer choice than 26 or 50M services. While the 26 and 50M services may well function above 4,000 meters, greater stability and lower cost make Reach DSL the better choice. Bottom line: If economy is the main consideration, then Reach DSL is probably the best choice above 3,000 meters. Above 4,000 meters, it's the best choice even if you want speed because the faster speeds may be unstable. Unfortunately, Reach DSL is not available at all exchanges. Reach DSL is also not available for users without NTT phone service. When Reach is not available, 50M is the best choice above 3,000 meters because it is the most likely to be stable. The 50M Revo service is a special type of DSL that has faster uploads and so is of interest especially to gamers and users who share large files (peering). The upload speed declines rapidly at about 800 meters, however, after which is it comparable to the regular (and cheaper) 50M service. The 50M Revo service is 315 yen/month more than the regular 50M service. Bottom line: For users who want to do fast uploads, 50M Revo service is a good choice up to about 700-800 meters or so from the server. If you are further than that distance, you may as well order the regular 50M service. Prices for the various services and campaign benefits for new subscribers vary according to the type of service, area of Japan and from building to building.